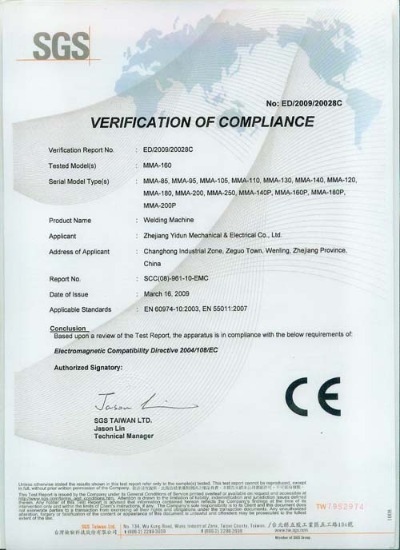 Company Overview - Zhejiang Yidun Mechanical & Electrical Co., Ltd.
12YRSZhejiang Yidun Mechanical & Electrical Co., Ltd.
zhengjiang yidun Mechanical & Electrical Co., Ltd. (it is our company's formal name,taizhou fenghui just before using) was founded in September 2001. Our company is specialized in the production of Welding Machines, Electric Motors, Grinding Machines and Air Compressors.We owns two factories, one for Welding Machines and another for Motors, Grinder, Compressors which cover more than 30,000 square meters. We have more than 50 high-precision production and testing equipment and 300 talented people, including 3 senior management teachers, 15 engineers and 20 technicians. Our company has abundant strength to research and develop new products of Welding Machines, 20 kinds and produce 250,000 motors. Our products sell well in domestic market and more than 20 countries abroad. Our products are manufactured with national technology standard design and advanced technology. 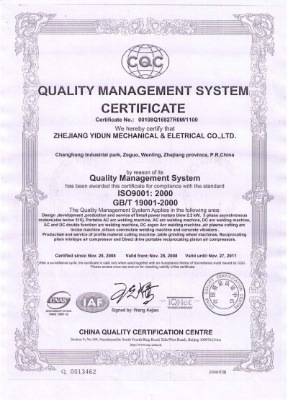 With microcomputer examination, they have passed the evaluation of ISO9001 system, CCC and CE certifications.